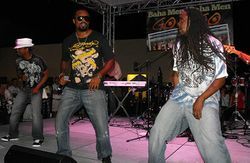 Baha Men are a Bahamian-American hip hop band, best known for their song "Who Let the Dogs Out?". They sang "Who Let the Milk Out?" and "Who Let Her Jugs Out?" in the season 14 episode "Large Marge" and "Who Wants a Haircut?" in the season 16 episode "Thank God It's Doomsday", which was later included in the album The Simpsons: Testify. Modified on November 20, 2016, at 11:59.